Over 60% of our planet is covered by water more than a mile deep. The deep sea is the largest habitat on earth and is largely unexplored. of the oceans’ depths, where life is bizarre, resilient and shockingly abundant. Most people familiar with the oceans know about life only in the intertidal zone, where the water meets land, and the epipelagic zone, the upper sunlit zone of the open ocean. Though these zones contain an abundance of ocean life because sunlight is available for photosynthesis, they make up only a small fraction of the ocean biome. In fact, most of the ocean is cold, dark and deep. It is important to realize that photosynthesis occurs only down to about 100 – 200 m, and sunlight disappears altogether at 1,000 m or less, while the ocean descends to a maximum depth of about 11,000 m in the Mariana Trench! To get an idea of how vast the ocean’s depths are, consider that 79% of the entire volume of the earth’s biosphere consists of waters with depths greater than 1,000 m. Until recently, the deep sea was largely unexplored. But advances in deep sea submersibles and image capturing and sampling technologies are increasing the opportunities for marine biologists to observe and uncover the mysteries of the deep ocean realm. Deep sea research is vital because this area is such an enormous part of the biosphere. Despite its depth and distance, it is still our backyard in comparison to outer space. And yet, human exploration has revealed more detail about the surface of the moon and Mars that it has about the deep sea! Consider that hydrothermal vents and their unique organisms, which revolutionized our ideas about energy sources and the adaptability of life, were only discovered in 1977. There may be yet other life-altering discoveries to be found at the bottom of the ocean. The oceans are divided into two broad realms; the pelagic and the benthic. Pelagic refers to the open water in which swimming and floating organisms live. Organisms living there are called the pelagos. From the shallowest to the deepest, biologists divide the pelagic into the epipelagic (less than 200 meters, where there can be photosynthesis), the mesopelagic (200 – 1,000 meters, the “twilight” zone with faint sunlight but no photosynthesis), the bathypelagic (1,000 – 4,000 meters), the abyssopelagic (4,000 – 6,000 meters) and the deepest, the hadopelagic (the deep trenches below 6,000 meters to about 11,000 m or 36,000 feet deep). The last three zones have no sunlight at all. Benthic zones are defined as the bottom sediments and other surfaces of a body of water such as an ocean or a lake. Organisms living in this zone are called benthos. They live in a close relationship with the bottom of the sea, with many of them permanently attached to it, some burrowed in it, others swimming just above it. In oceanic environments, benthic habitats are zoned by depth, generally corresponding to the comparable pelagic zones: the intertidal (where sea meets land, with no pelagic equivalent), the subtidal (the continental shelves, to about 200 m), the bathyal (generally the continental slopes to 4,000 m), the abyssal (most of the deep ocean seafloor, 4,000 – 6,000 m), and the hadal (the deep trenches 6,000 to 11,000 m). There are several types of deep benthic surfaces, each having different life forms. First, most of the deep seafloor consists of mud (very fine sediment particles) or “ooze” (defined as mud with a high percentage of organic remains) due to the accumulation of pelagic organisms that sink after they die. [Unlike the shoreline, sandy habitats are rarely found in the deep sea because sand particles, created by wave action on coral and rocks at shorelines, are too heavy to be carried by currents to the deep.] Second, benthic areas too steep for sediment to stick are rocky. Rocky areas are found on the flanks of islands, seamounts, rocky banks, on mid-ocean ridges and their rift valleys, and some parts of continental slopes. At the mid-ocean ridges, where magma wells up and pushes seafloor tectonic plates apart, even flat surfaces are rocky because these areas are too geologically new to have accumulated much mud or ooze. Third, in some areas certain chemical reactions produce unique benthic formations. The best known of these formations are the “smoker” chimneys created by hydrothermal vents, which are described in detail below. Exploration of these zones has presented a challenge to scientists for decades and much remains to be discovered. However, advances in technology are increasingly allowing scientists to learn more about the strange and mysterious life that exists in this harsh environment. Life in the deep sea must withstand total darkness (except for non-solar light such as bioluminescence), extreme cold, and great pressure. To learn more about deep-sea marine life, sophisticated data collection devices have been developed to collect observations and even geological and biological samples from the deep. First, advances in observational equipment such as fiber optics that use LED light and low light cameras has increased our understanding of the behaviors and characteristics of deep sea creatures in their natural habitat. Such equipment may be deployed on permanent subsea stations connected to land by fiber optic cables, or on “lander” devices which drop to the seafloor and which are later retrieved (typically after a radio command activates the dropping of ballast so the lander may float up.) 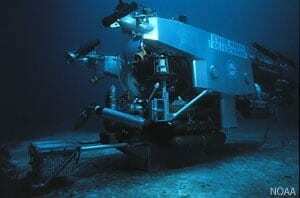 Second, remotely operated vehicles (ROVs) have been used underwater since the 1950s. ROVs are basically unmanned submarine robots with umbilical cables used to transmit data between the vehicle and researcher for remote operation in areas where diving is constrained by physical hazards. ROVs are often fitted with video and still cameras as well as with mechanical tools such as mechanical arms for specimen retrieval and measurements. Other unmanned submarine robots include AUVs (autonomous undersea vehicles) that operate without a cable, and the USA’s new Nereus, a hybrid unmanned sub which can switch from ROV to AUV mode and which is currently the world’s only unmanned submarine capable of reaching the deepest trenches. Third, manned deep sea submersibles are also used to explore the ocean’s depths. Alvin is an American deep sea submersible built in 1964 that has been used extensively over the past 4 decades to shed light on the black ocean depths. Like ROVs, it has cameras and mechanical arms. 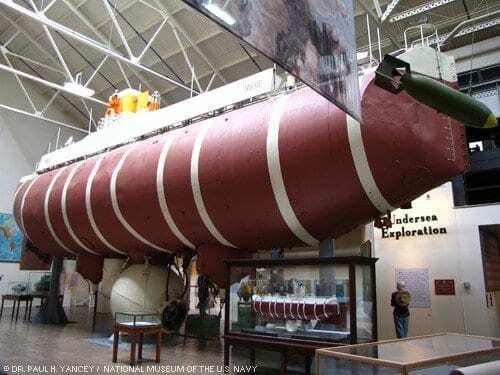 This sub, which carries 3 people (typically a pilot and 2 scientists), has been used for more than 4,000 dives reaching a maximum depth of more than 4,500 m. France, Japan and Russia have similar manned scientific submersibles that can reach somewhat greater depths, while China is currently building one to reach 7,000 m.
The bathyscaphe Trieste at the National Museum of the U.S. Navy in Washington, D.C.
Until 2012, only one manned submarine device has ever reached the bottom of Mariana trench at almost 11,000 m: the bathyscaphe Trieste manned by Jacques Piccard and Don Walsh. During the Trieste’s single dive in 1960, its windows began to crack, and it has never been used since. 52 years later, on March 25, 2012 (March 26 local time), James Cameron successfully dove in his commissioned one-man sub to the Challenger Deep. Don Walsh was invited to join the expedition. biotic ones, that is, other organisms that may be potential predators, food, mates, competitors or symbionts. All these factors have led to fascinating adaptions of deep sea life for sensing, feeding, reproducing, moving, and avoiding being eaten by predators. The deep sea begins below about 200 m, where sunlight becomes inadequate for photosynthesis. From there to about 1,000 m, the mesopelagic or “twilight” zone, sunlight continues to decrease until it is gone altogether. This faint light is deep blue in color because all the other colors of light are absorbed at depth. The deepest ocean waters below 1,000 m are as black as night as far as sunlight is concerned. And yet, there IS some light. People who dive deep in a submersible (with its lights off) are often mesmerized by an incredible “light show” of floating, swirling, zooming flashes of light. This is bioluminescence, a chemical reaction in a microbe or animal body that creates light without heat, and it is very common. And yet, this light is low compared to sunlight, so animals here — as well as those in the mesopelagic zone — need special sensory adaptations. Many deep-sea fish such as the stout blacksmelt have very large eyes to capture what little light exists. Other animals such as tripodfishes are essentially blind and instead rely on other, enhanced senses including smell, touch and vibration. “burglar alarms” in which an animal being attacked illuminates its attacker (the “burglar”) so that an even bigger predator (the “police”) will see the burglar and go after it. Some swimming sea cucumbers even coat their attackers with sticky glowing mucus so the “police” predators can find them many minutes later. Most bioluminescence is blue, or blue-green, because those are the colors that travel farthest in water. As a result, most animals have lost the ability to see red light, since that is the color of sunlight that disappears first with depth. But a few creatures, like the dragonfish, have evolved the ability to produce red light. This light, which the dragonfish can see, gives it a secret “sniper” light to shine on prey that do not even know they are being lit up! Considering the volume of water above the deepest parts of the ocean, it’s no wonder that hydrostatic pressure is one of the most important environmental factors affecting deep sea life. Pressure increases 1 atmosphere (atm) for each 10 m in depth. The deep sea varies in depth from 200 m to about 11,000 m, therefore pressure ranges from 20 atm to more than 1,100 atm. High pressures can cause air pockets, such as in fish swim bladders, to be crushed, but it does not compress water itself very much. Instead, high pressure distorts complex biomolecules — especially membranes and proteins — upon which all life depends. Indeed, many food companies now use high pressure to sterilize their products such as packaged meats. Life appears to cope with pressure effects on biomolecules in two ways. First, their membranes and proteins have pressure-resistant structures that work by mechanisms not yet fully understood, but which also mean their biomolecules do not work well under low pressure in shallow waters. Second, some organisms may use “piezolytes” (from the Greek “piezin” for pressure). These are small organic molecules recently discovered that somehow prevent pressure from distorting large biomolecules. One of these piezolytes is trimethylamine oxide (TMAO). This molecule is familiar to most people because it gives rise to the fishy smell of marine fish and shrimp. TMAO is found at low levels in shallow marine fish and shrimp that humans routinely eat, but TMAO levels increase linearly with depth and pressure in other species. Really deep fish, including some grenadiers which humans are now fishing, smell much more fishy! Animals brought from great depth to the surface in nets and submersible sample boxes generally die; in the case of some (but not most) deep-sea fishes, their gas-filled swim bladder (adapted to resist high pressure) expands to a deadly size. However, the vast majority of deep-sea life has no air pockets that would expand as pressure drops during retrieval. Instead, it is thought that rapid pressure as well as temperature changes kill them because their biomolecules no longer work well (high TMAO does not help, as it appears to be too high in deep-sea life for biomolecules to work properly at the surface). Advances in deep sea technology are now enabling scientists to collect species samples in chambers under pressure so that they reach the surface for study in good condition. Pressure-adapted microbes have been retrieved from trenches down to 11,000 m, and have been found in the laboratory to have all these adaptations (pressure-resistant biomolecules and piezolytes). However, pressure adaptations have only been studied in animals down to about 5,000 m. We do not yet know if the adaptations found at those depths work at greater depths down to 11,000 m.
Except in polar waters, the difference in temperature between the euphotic, or sunlit, zone near the surface and the deep sea can be dramatic because of thermoclines, or the separation of water layers of differing temperatures. In the tropics, for example, a layer of warm water over 20°C floats on top of the cold, dense deeper water. In most parts of the deep sea, the water temperature is more uniform and constant. With the exception of hydrothermal vent communities where hot water is emitted into the cold waters, the deep sea temperature remains between about -1 to about +4°C. However, water never freezes in the deep sea (note that, because of salt, seawater freezes at -1.8°C). If it did somehow freeze, it would just float to the surface as ice! Life in the deep is thought to adapt to this intense cold in the same ways that shallow marine life does in the polar seas. This is by having “loose” flexible proteins and unsaturated membranes which do not stiffen up in the cold. Membranes are made of fats and need to be somewhat flexible to work well, so you may be familiar with this adaptation in your kitchen. Butter, a saturated fat, is very hard in your refrigerator and would make a poor membrane in the cold, while olive oil — an unsaturated fat — is semi-solid and would make a good flexible membrane. However, as with pressure, there is a tradeoff: loose membranes and proteins of cold-adapted organisms readily fall apart at higher temperatures (much as olive oil turns to liquid at room temperature). 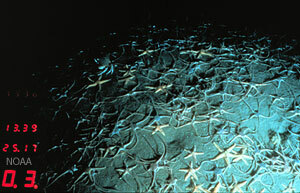 The dark, cold waters of much of the deep sea have adequate oxygen. This is because cold water can dissolve more oxygen than warm water, and the deepest waters generally originate from shallow polar seas. In certain places in the northern and southern seas, oxygen-rich waters cool off so much that they become dense enough to sink to the bottom of the sea. These so-called thermohaline currents can travel at depth around the globe, and oxygen remains sufficient for life because there is not enough biomass to use it all up. However, there are also oxygen-poor environments in intermediate zones, wherever there is no oxygen made by photosynthesis and there are no thermohaline currents. 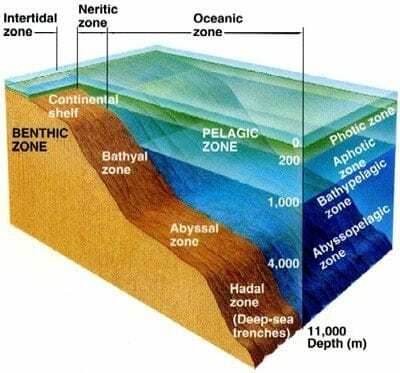 These areas, called oxygen minimum zones, usually lie at depths between 500 – 1,000 m in temperate and tropical regions. Here, animals as well as bacteria that feed on decaying food particles descending through the water column use oxygen, which can consequently drop to near zero in some areas. Biologists are still investigating how animals survive under such conditions. 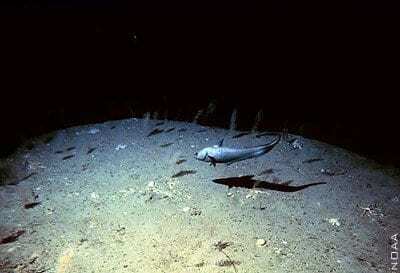 Although most of the deep seafloor has oxygen, there are exceptions in isolated basins with no circulation. Some of these basins that have no oxygen are found at the bottom of the Mediterranean Sea. In 2010, scientists investigating these at 3,000 m depths made a startling discovery: the first known animals to be living continuously without any oxygen. The animals are tiny Loriciferans, members of an animal phylum first discovered in 1983. How they can survive these conditions is not yet known [see Animals thrive without oxygen at sea bottom]. Deep sea creatures have evolved some fascinating feeding mechanisms because food is scarce in these zones. In the absence of photosynthesis, most food consists of detritus — the decaying remains of microbes, algae, plants and animals from the upper zones of the ocean — and other organisms in the deep. Scavengers on the seafloor that eat this “rain” of detritus include sea cucumbers (the most common benthic animal of the deep), brittle stars (seen in the photo above), and grenadier or rattail fish. The corpses of large animals such as whales that sink to the bottom provide infrequent but enormous feasts for deep sea animals and are consumed by a variety of species. This includes jawless fish such as hagfish, which burrow into carcasses, quickly consuming them from the inside out; scavenger sharks; crabs; and a newly discovered group of worms (called Osedax, meaning bone-eater) which grow root-like structures into the bone marrow! Deep-sea pelagic fish such as gulper eels have very large mouths, huge hinged jaws and large and expandable stomachs to engulf and process large quantities of scarce food. Many deep-sea pelagic fish have extremely long fang-like teeth that point inward. This ensures that any prey captured has little chance of escape. Some species, such as the deep sea anglerfish and the viperfish, are also equipped with a long, thin modified dorsal fin on their heads tipped with a photophore lit with bioluminescence used to lure prey. Many of these fish don’t expend much energy swimming in search of food; rather they remain in one place and ambush their prey using clever adaptations such as these lures. Others, such as rattails or grenadiers (pictured below) cruise slowly over the seafloor listening and smelling for food sources failing from above, which they engulf with their large mouths. Many mesopelagic and deeper pelagic species also save energy by having watery, gelatinous muscles and other tissues with low nutritive content. For example, an epipelagic tuna’s muscle (the kind you might eat) may be 20% protein. This makes for a strong, fast muscle, but also takes considerable energy to maintain. In contrast, a deep pelagic blacksmelt or viperfish may have only 5-8% protein. This means they cannot swim as well as a tuna, but they can achieve a larger body size with much less maintenance costs. Some mesopelagic species have adapted to the low food supply (and sometimes to the low oxygen content) in moderate-depth waters with a special behavior called vertical migration. At dusk, millions of lantern fish, shrimp, jellies and other mobile animals migrate to the food-rich surface waters to feed in the darkness of night. Then, presumably to avoid being eaten in daylight, they return to the depths at dawn to digest. Some of the species undergo large pressure and temperature changes during their daily migrations, but we do not yet know exactly how they cope with those dramatic daily changes. Since plankton is scarce in the deep sea, filter feeding (the most common mode of feeding in shallow waters) is a difficult way to make a living. Consequently, some deep-sea animals belonging to groups once thought to be exclusively filter feeders have evolved into carnivores! One of these is the carnivorous sea squirt Megalodicopia hians. Sea squirts or tunicates are generally harmless filter feeders which draw in microscopic organisms through a siphon tube, but Megalodicopia hians has a huge jaw-like siphon that can rapidly engulf swimming animals! Another of these is the ping-pong-tree sponge, Chondrocladia lampadiglobus. Again, the vast majority of sponges draw in microscopic material through tiny pores, but this sponge has tree-like branches with large glass globes covered in Velcro-like sharp spikes that impale swimming prey! We’ve described many of the unique adaptations that animals of the deep-sea have evolved to cope with their harsh environment. Let’s look at some others, not all of which are fully understood. Body Color: This is often used by animals everywhere for camouflage and protection from predators. 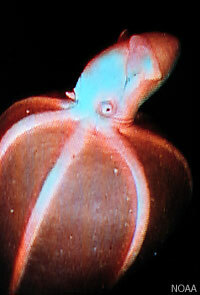 In the deep sea, animals’ bodies are often transparent (such as many jellies and squids), black (such as blacksmelt fish), or even red (such as many shrimp and other squids). The absence of red light at these depths keeps them concealed from both predators and prey. Some mesopelagic fish such as hatchetfish have silvery sides that reflect the faint sunlight, making them hard to see. Reproduction: Consider how hard it must be to find a mate in the vast dark depths. For most deep sea species, we do not know how they achieve this. Earlier we noted that unique light patterns may aid in this. Deep-sea anglerfish may use such light patterns as well as scents to find mates, but they also have another interesting reproductive adaptation. Males are tiny in comparison to females and attach themselves to their mate using hooked teeth, establishing a parasitic-like relationship for life. The blood vessels of the male merges with the female’s so that he receives nourishment from her. In exchange, the female is provided with a very reliable sperm source, avoiding the problem of having to locate a new mate every breeding cycle. Gigantism: Another possible adaptation that is not fully understood is called deep-sea gigantism. This is the tendency for certain types of animals to become truly enormous in size. A well-known example is the giant squid, but there are many others such as the colossal squid, the giant isopod, the king-of-herrings oarfish (which may be the source of sea-serpent legends), and the recently captured giant amphipod from 7,000 m in the Kermadec Trench near New Zealand. 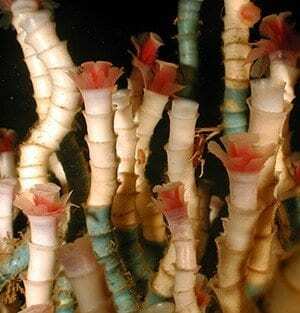 While the giant tubeworms of hydrothermal vents (see below) grow well due to abundant energy supplies, the other gigantic animals live in food-poor habitats, and it is not known how they achieve such growth. It may simply be a result of the feature we examine next: long lives. Life in the deep sea is relatively sparse compared to the epipelagic (euphotic) and intertidal zones, with two exciting, and relatively recently discovered exceptions — hydrothermal vent and cold seep communities. These amazing formations were first discovered in 1976 – 77 during a deep sea expedition with Alvin at a mid-ocean ridge near the Galapagos. At that time, only geologists were aboard, with the goal of directly observing seafloor spreading — the mid-ocean ridges being places where magma welling up underneath pushes two tectonic plates apart, creating a rift valley between them. Some geologists thought there might be geyser-like hot springs, as found in rift valleys on land (such as in Iceland), while others thought that high pressure would prevent such formations. However no one predicted any interesting biology. What they found not only revolutionized geology but biology even more so. These dives to depths of about 2,700 m revealed hot springs of far greater complexity and beauty than anyone had imagined: hot mineral-rich water spewing (like continuous geysers) from vents heated by magma, with metal sulfides precipitating in the cold surrounding seawater to form intricate, colorful and often towering chimneys. Moreover, a completely unexpected community of life was found around these aptly named hydrothermal vents, with not only high densities of numerous new species, but also a new kind of ecosystem flourishing in the dark that had never been imagined by scientists — an ecosystem based on toxic gas! The most amazing of the new species was a giant tubeworm, named Riftia. Growing rapidly in dense clusters, these 2-meter-tall worms were found to have no digestive tract. The revolutionary finding was that they subsist on energy-rich hydrogen sulfide in vent water and generated in the Earth’s crust. Hydrogen sulfide (rotten-egg gas) is normally toxic to animals, but these worms avoid the problem in a spectacular manner. They harbor bacteria known as chemoautotrophs (in a large sac replacing a digestive system), which can use the energy in hydrogen sulfide to convert carbon dioxide into sugars, just as plants do using sunlight. The worm’s blood picks up and delivers sulfide, carbon dioxide and oxygen to these bacterial symbionts, which in turn “feed” their hosts with the excess sugars they make (while turning the sulfide into a non-toxic waste product). Thus, the ecosystem was found to run on the Earth’s geothermal energy rather than sunlight. Many scientists now think that life on Earth began at such vents over 3 billion years ago. Since those first discoveries near the Galapagos, hydrothermal vent communities have been found at depths ranging from about 1,500 m to over 5,000 m [see Expedition to Mid-Cayman Rise Identifies Unusual Variety of Deep Sea Vents]. Most vents are along the mid-ocean ridges, where magma is close to seawater. Other animals with bacterial symbionts have been found, including other species of tubeworms, giant clams and mussels, snails, and shrimp. Undoubtedly many vent communities are yet to be found, since many ridge areas have not yet been explored. The water temperature of vents is much warmer than normal for the deep sea (about 2°C), reaching as high at 400°C without boiling due to the high pressure. However, nothing can live at such temperatures. The communities of vent life are mostly found between about 8 – 25°C, but may reach perhaps 60°C around some animals such as Pompeii worms (Alvinella). Though complex life seems not to live at higher temperatures, some archaea have been found living at temperatures of over 120°C! After the first vent discoveries, other unexpected high-density deep-sea ecosystems were found. Named cold seeps, these occur at places (mostly along continental margins) where cold methane (which at depths below 500 m forms methane-hydrate “ice”), hydrogen sulfide, and/or oil seep out of sediments to provide abundant energy. By some estimates, there is more energy locked up in the methane hydrates than in all (other) fossil/hydrocarbon fuels combined. Animals with symbiotic bacteria were found, different from but related to vent species, including tubeworms, clams, and mussels. Some mussels harbor methane-using bacteria instead of sulfide-using ones, making ecosystems powered by natural gas! Dense seep communities have also been found around deep brine pools, or “lakes within oceans.” These form where salt deposits under the ocean floor dissolve to form pools of water so dense from their salt content that they do not mix with the overlying seawater. So far a few of these have been found in the Gulf of Mexico and the Mediterranean Sea. At the best-studied brine pool (in the Gulf of Mexico: [see Lakes Within Oceans] high densities of mussels live around the rim, subsisting (using symbionts) on methane gas seeping from the pool. However, no known animal can survive the salt within the pool itself. Various microbes have been found in the high salt waters, however. In 2012, a new deep-sea ecosystem dubbed a “hydrothermal seep” was discovered off Costa Rica. It is a mosaic of vent and seep communities, with many new species. See the news story “Hot Meets Cold at New Deep-Sea Ecosystem” for more information. The Silent Deep: The Discovery, Ecology, and Conservation of the Deep Sea, T. Koslow, Univ. Chicago Press, 2009. Deep-Sea Biodiversity: Pattern and Scale by M.A. Rex and R.J. Etter, Harvard Univ. Press, 2010.